Yu-Gi-Oh! The Sacred Cards known as Yu-Gi-Oh! Duel Monsters 7: The Duelcity Legend in Japan, is an RPG-style game for the Game Boy Advance. For the first time, players had the opportunity to use the Egyptian God Cards in the video games; albeit with altered effects to adhere to the game's simplified gameplay mechanics. 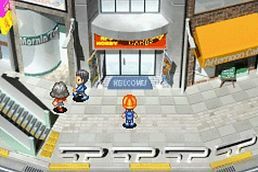 The story of the game loosely followed the Battle City story arc of the anime and manga, with adjustments to allow the player to act the part of a major character and participate all the way into the Battle City Finals. The game automatically cuts to the ending sequence immediately after the defeat of Marik Ishtar, with no option to save. Because of this, any money or rare cards earned in the final duel are irrelevant, and the player never has an opportunity to use The Winged Dragon of Ra without the use of a game-hacking device. The only way to do this normally is to allow Marik to Summon Ra and destroy it (or somehow discard it from the hand), then Special Summon it from the graveyard. Also noticeable that even in the English version of the game, most of the cards have their original OCG artworks like "Soul of the Pure", "Monster Reborn", and "Last Day of Witch". A Konami 'cameo' in this game is the Miracle Moon music in the arcade, which is taken from the Beatmania series of games. The game starts when the player and his two friends, Yugi Muto and Joey Wheeler are preparing for the Battle City tournament of the card game, Duel Monsters. In order to win the tournament, the player must obtain six Locator Cards which are received after beating certain characters in Duel Monsters. After all of the locators are obtained, the player is entered into the finals. However, a mysterious person named Marik has a gang of card thieves, known as the Ghouls, which he is using to obtain the three Egyptian God Cards to bring the world to darkness. Marik's rare hunters eventually take over the whole city. Even the owner of the card shop works for Marik and tries to kill the player. Then, the player meets Ishizu Ishtar, who challenges them to a game of Duel Monsters, to see if he is strong enough to wield an Egyptian God Card. After she is beaten, the player must beat Seto Kaiba, the person that organized the tournament, in order to obtain the first God card. After the player gets into the finals which take place on a blimp, he duels Marik. After Marik is beaten, it is found out that it was not really Marik. It was actually one of Marik's servants. The real Marik was the person the player met earlier in the game that became one of Yugi's friends: Namu. Then, Marik starts stealing the souls of those he beats. After Marik defeats Kaiba, the player must challenge Yugi. After Yugi is beaten, the player must face Marik. The game can't be saved after beaten so once the game is beaten, you will restart at the last save point. Dueling partially resembles the real-life game mechanics, albeit with some elements that make it resemble Duelist Kingdom rules. A Divine Attribute exists, meaning monsters of that Attribute are unaffected by these Attribute cycles and must be destroyed either by card effects or in stat-based battle. Monster Effects must be activated manually, and only while the monster is face-down. Monsters are face-down when first played from the hand, and turn face-up if left in Attack Position at the end of the turn. Ritual Monsters can be Normal Summoned like other monsters. Ritual Spells also exist, but Ritual Summons work slightly differently. If the Ritual Spell specifies a certain monster, you must control that monster, manually Tribute 2 other monsters you control, then activate the Ritual Spell. The specified monster will then be transformed into the Ritual Monster of interest. Fusion Monsters do not exist. Trap Cards activate automatically if the conditions are met. The player has no control over whether to activate a Trap Card or not. The only accessible monsters in the Graveyards (for purposes like Monster Reborn, etc) is the most recent one sent there. In cases of multiple monsters being destroyed (e.g. Raigeki), the monster in the right-most zone will be the only one available. Field Cards give a +30% or -30% stat boost dependent on the monster's Type. No Field Spell Zone is available - playing a field-altering Spell Card will change the background to reflect this. "Power up" and "power down" comes in the form of ATK/DEF boosts in increments of 500. An effect that, for example, says "power up twice", would boost ATK and DEF by 1000. The maximum hand capacity is 5 cards. If a player's hand is already at 5 cards, they do not draw cards. Cards can be freely discarded from hand or field at will, however, if space is needed. Many monster and card effects are altered. Real-life Effect monsters may be Normal Monsters instead (e.g. Man-Eater Bug), while some other Normal Monsters can gain effects in this game. The Ante Rule applies for all Duels. If you ante a card and win the Duel, you receive a random card from the opponent, usually something from the Deck they use. Losing the Duel will only lose that card you offered. Choosing not to ante means you do not receive a bonus card. Two factors dictating deck building are Duelist Level and Deck Capacity. Every card has a Deck Cost associated with it. To use a card, a player's Duelist Level must be equal to or higher than the card's cost. This cost also determines how much Deck Capacity the card occupies, and all the cards in the player's Deck must be equal to or less than the Deck Capacity available to the player. A Deck must have exactly 40 cards. Deck Capacity is increased by winning Duels. Every 3 Deck Capacity increase or so grants you 1 Duelist Level increase. Yu-Gi-Oh! The Sacred Cards received mediocre reviews with an average of 58% on Game Rankings. It was criticized for its shortness. However, the game sold nearly 1 million units, with 750,000 copies in the United States  and over 238,000 in Japan, and received a sequel, Yu-Gi-Oh! Reshef of Destruction. At the time of its release, Yu-Gi-Oh! The Sacred Cards featured 26 cards that did not have an OCG/TCG version. This page was last edited on 18 April 2019, at 10:51.